This page is no longer being updated. As of May 2009, I am affililiated with EPFL as a postdoc within the Learning Algorithms and Systems Laboratory (LASA). Please visit my current website here. I am a current (5th year, ABD) Ph.D. candidate in the Robotics Institute at Carnegie Mellon University. I received my M.S. in Robotics in 2006, and B.S. in Mathematics in 2002, along with minors in Music and Biology, also from Carnegie Mellon. My research interests lie with robot autonomy and low level motion control, and how machine learning may be used to build control algorithms to accomplish motion tasks. I am affiliated with the CORAL Research Group. For part of 2007 I lived in Doha, Qatar, while assistant-teaching at Carnegie Mellon's Qatar Campus. In the summer of 2008 I was an intern within the Autonomous Systems Laboratory at CSIRO in Brisbane, Australia. I also volunteer as a procedure counselor with Planned Parenthood. My research interests center upon using machine learning techniques that build low level robot motion control algorithms, also called policies. The execution of motion tasks is central to the success of many robotics applications. However, developing policies which enable skillful execution within real world environments is often challenging and nontrivial. One solution is to have a robot learn its policy. I focus on the particular approach of Learning from Demonstration. Within this learning paradigm, a teacher demonstrates to provide example executions of a task, and from these the learner generalizes a control policy. My thesis explores ways in which a human teacher might effectively train and advise a robot learner. The robot learning algorithms I have developed build policies through a combination of human demonstration and advice. The general framework is that demonstration provides the learner with an initial policy. Human advice is then offered in response to policy execution by the robot learner. This advice is incorporated by the learner, to improve its policy. In earlier work, advice was a binary critique of robot performance [HRI 2007]. More recent work has developed a richer advice representation, through which the human teacher may provide corrections on the robot execution [IROS 2008]. These corrections are continuous-valued, yet only require the teacher to select from a finite list. I have implemented and validated these algorithms on Segway RMP robots, performing planar motion tasks. Empirical results have shown policy performance to improve with advice, both within simulation and on real robots. With my thesis work, I investigate a subset of problems within a larger context: the goal of robots operating autonomously within real world environments. How they interact with humans and other robots while doing this is also a focus of my research. The demonstration-advice work of my thesis explores teacher-learner interactions. Another area of interest to me is teammate peer interactions. Through participation in two projects at Carnegie Mellon, I have explored this area of human-robot and robot-robot teammate interactions. The first is Segway Soccer, a league within Robocup robot soccer, in which teams of humans and robots organize and cooperate together in soccer competition against other human-robot teams [HRI 2006]. 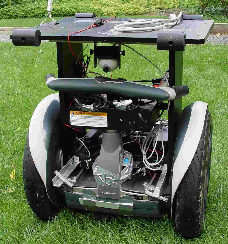 The second is the Boeing Treasure Hunt project, in which heterogeneous teams of humans a variety of robots coordinate together in pursuit of a common task goal [ICRA 2006, IAS 2008]. My previous work in the field of functional brain imaging was with the Laboratory of Brain and Cognition, at the National Institutes of Health. There I was involved in the acquisition and analysis of functional MRI data, and development of a method for cortical surface averaging across subjects. Typical averaging methods distort the brain, either to a standard volume or a standard cortical pattern. In contrast to this, our method simply imposes a standardized mesh onto the surface of the brain. Averaging is then performed by mesh index, without distortion and within the original space of the brain [HBM 2006]. B. Argall, B. Browning, and M. Veloso. Learning Robot Motion Control from Demonstration and Human Advice. Under submission. M. S. Beauchamp, K. Lee, B. D. Argall, A. Martin. Regions in Temporoparietal Junction and Posterior Superior Temporal Gyrus That Integrate Auditory and Visual Information about Complex Objects. Cognitive Neuroscience Society Annual Meeting, Abs. 319, 2003. M.S. Beauchamp, K. Lee, B. D. Argall, A. Martin. A Region in Posterior Superior Temporal Sulcus that Integrates Auditory and Visual Information about Complex Objects. 9th International Conference on Functional Mapping of the Human Brain, Abs. 64. 2003. Z. S. Saad, B. D. Argall, M. S. Beauchamp, S. Japee, R. W. Cox. Standard Cortical Surface Models for Node-Based Cross-Subject Analysis. 33rd Meeting for the Society for Neuroscience, Abs. 863.21, 2003. Z. S. Saad, B. D. Argall, M. S. Beauchamp, S. A. Japee, R. W. Cox. Standard Meshes for Inter- and Intra-Subject Surface-based Analysis with Minimal Interpolation. 9th International Conference on Functional Mapping of the Human Brain, Abs. 1145, 2003.